, a learned divine of the church of Rome, who was long resident in England, was born at Vernon in “Normandy, in the year 1681, and being educated for the church, became canon regular and librarian of the abbey of St. Genevieve, a situation extremely favourable to the prosecution of his studies, as the library of which he had the care is a very considerable one. Among other theological inquiries, he engaged in one, which was productive of very important consequences respecting his future life. Having been employed in reading abbe Reuaudot’s” Memoire sur la validite des Ordinations des Anglois,“inserted in abbe Gould’s” La veritable croyance de T’eglise Catholique,“he was induced to enter into a farther examination of that subject. Accordingly he drew up a memoir upon it, for his own satisfaction only, but which grew insensibly into a treatise; and at the instance of some friends to whom it was communicated, he was at length prevailed with to consent to its publication. He therefore made the usual application for permission to print it; and obtained the approbation of Mons. Arnaudin, the royal licenser of the press. Some persons, however, afterwards found means to prevail on the chancellor to refuse to affix the seal to the approbation of the licenser. Terms were proposed to father Courayer, to which he could not accede, and he gave up all thoughts of publishing. Some of his friends, however, being in possession of a copy, resolved to print it; and this obliged him to acquiesce in the | publication. When he first wrote his treatise, all his materials were taken from printed authorities, and he had no acquaintance or correspondence in England. But sundry difficulties, which occurred to him in the course of his inquiries, suggested to him the propriety of writing to England, in order to obtain clearer information on some points; and knowing that a correspondence had been carried on between Dr. Wake, then archbishop of Canterbury, and Dr. Dupin, on the project of re-uniting the churches of England and France, he took the liberty, in 1721, although entirely unknown to that prelate, to desire his information respecting some particulars. The archbishop answered his inquiries with great readiness, candour, and politeness, and many letters passed between them on this occasion. Father Courayer’s book was at length published in 1723, in two volumes small 8vo, entitled,” Dissertation sur la validite des Ordinations des Anglois, et sur la Succession des Evesques de l’Eglise Anglicane: avec les preuves justificatives des faits avancez dans cet ouvrage.“It was printed at Nancy, though Brussels is placed in the title. It was afterwards translated into English, by the rev. 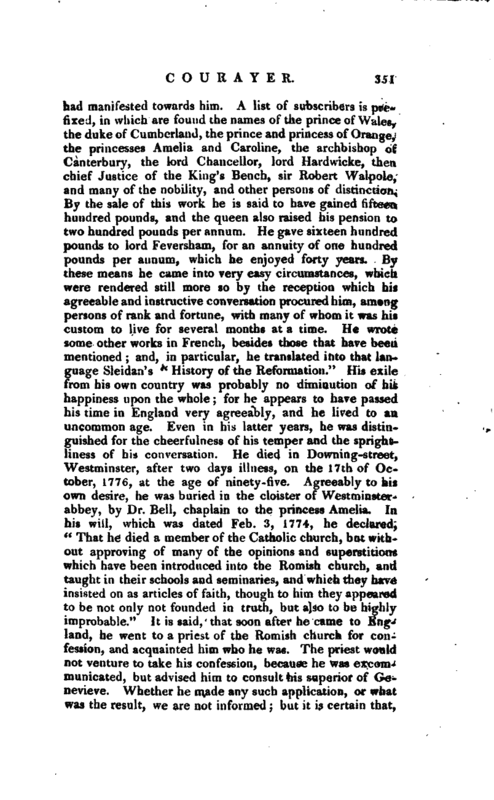 Mr. Daniel Williams, and published at London in one volume 8vo, under the title” A Defence of the validity of the English Ordinations, and of the Succession of the Bishops in the Church of England: together with proofs justifying the facts advanced in this treatise.“Father Courayer’s work was immediately attacked by several popish writers, particularly by father le Quien and father Hardouin. But in 1726 he published, in four volumes 12mo,” Defense de la Dissertation sur la validite des Ordinations des Anglois, coutre les differentes reponsesqui y out 6te faites. Avec les preuves justiticatives des faits avancez dans cet ouvrage. 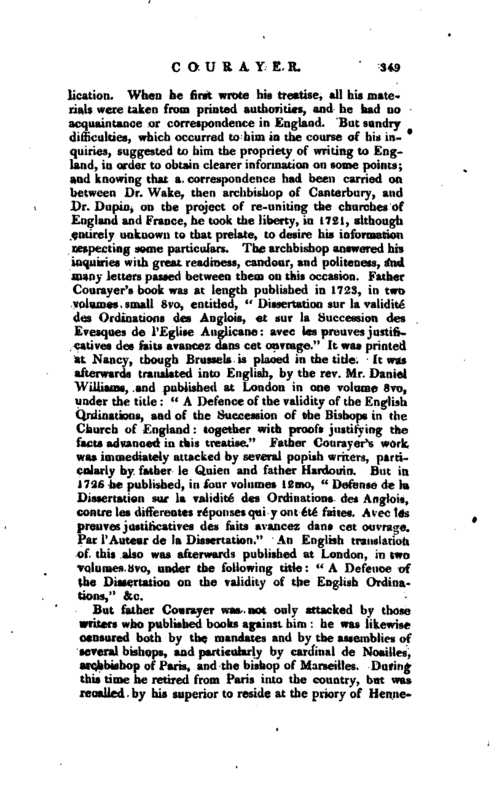 Par l’Auteur de la Dissertation.“An English translation of this also was afterwards published at London, in two volumes 8 vo, under the following title:” A Defence of the Dissertation on the validity of the English Ordinations," &c.
But father Courayer was not only attacked by those writers who published books against him: he was likewise censured both by the mandates and by the assemblies of several bishops, and particularly by cardinal de Noaiiles, archbishop of Paris, and the bishop of Marseilles. During this time he retired from Paris into the country, but was recalled by his superior to reside at the priory of | Hennemonte, four leagues from Paris. Here he received a diploma for the degree of doctor in divinity from the university of Oxford, dated Aug. 28, 1727: and from hence he returned his thanks to the University in an elegant Latin letter, dated Dec. 1, the same year, both of which he afterwards printed. 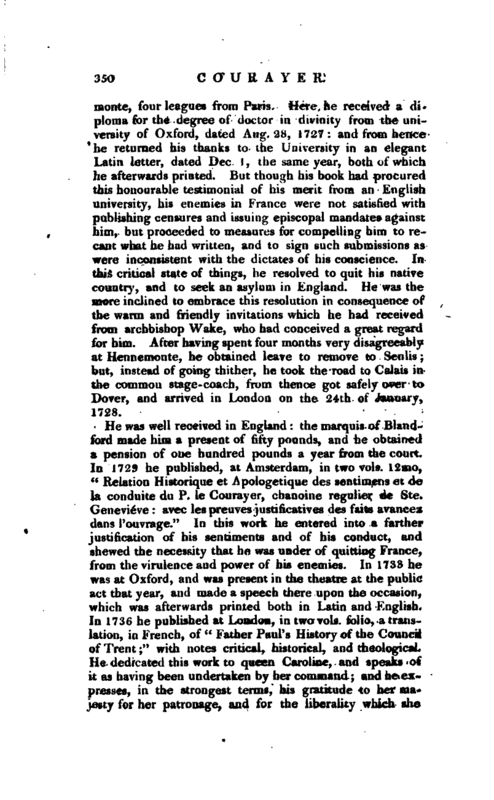 But though his book had procured this honourable testimonial of his merit from an English university, his enemies in France were not satisfied with publishing censures and issuing episcopal mandates against him, but proceeded to measures for compelling him to recant what he had written, and to sign such submissions as were inconsistent with the dictates of his conscience. In this critical state of things, he resolved to quit his native country, and to seek an asylum in England. He was the more inclined to embrace this resolution in consequence of the warm and friendly invitations which he had received from archbishop Wake, who had conceived a great regard for him. After having spent four months very disagreeably at Hennemonte, he obtained leave to remove to Senlis; but, instead of going thither, he took the road to Calais in the common stage-coach, from thence got safely over to Dover, and arrived in London on the 24tlr of January, 1728. He was well received in England: the marquis of Blandford made him a present of fifty pounds, and he obtained a pension of one hundred pounds a year from the court. 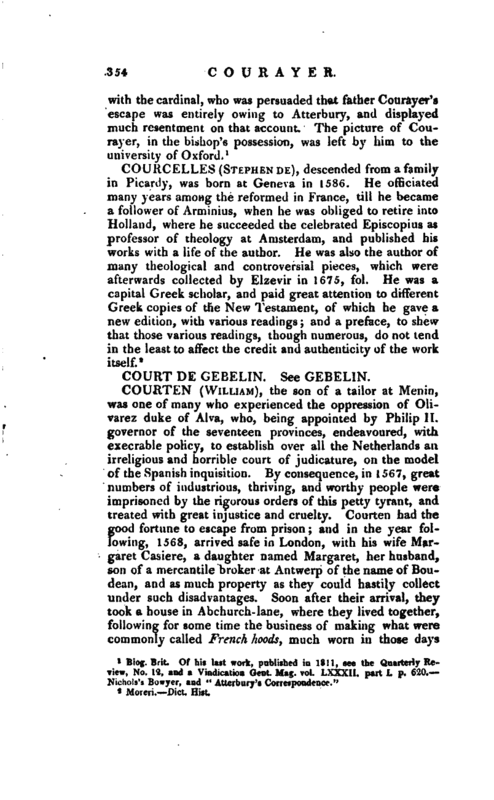 In 1729 he published, at Amsterdam, in two vols. 12mo, “Relation Historique et Apologetique des sentimens et de la conduite du P. le Courayer, chanoine regulier de Ste. Genevieve: avec les preuves justificatives des faits avancez dans l’ouvrage.” In this work he entered into a farther justification of his sentiments and of his conduct, and shewed the necessity that he was under of quitting France, from the virulence and power of his enemies. In 1733 he was at Oxford, and was present in the theatre at the public act that year, and made a speech there upon the occasion, which was afterwards printed both in Latin and English. In 1726 he published at London, in two vols. folio, a translation, in French, of “Father Paul’s History of the Council of Trent;” with notes critical, historical, and theological. He dedicated this work to queen Caroline, and speaks of it as having been undertaken by her command; and he expresses, in the strongest terms, his gratitude to her majesty for her patronage, and for the liberality which she | liad manifested towards him. A list of subscribers is prefixed, in which are found the names of the prince of Wales, the duke of Cumberland, the prince and princess of Orange, the princesses Amelia and Caroline, the archbishop of Canterbury, the lord Chancellor, lord Hardwicke, then chief Justice of the King’s Bench, sir Robert Walpole, and many of the nobility, andother persons of distinction. By the sale of this work he is said to have gained fifteen hundred pounds, and the queen also raised his pension to two hundred pounds per annum. He gave sixteen hundred pounds to lord Feversham, for an annuity of one hundred pounds per annum, which he enjoyed forty years. By these means he came into very easy circumstances, which were rendered still more so by the reception which his agreeable and instructive conversation procured him, among persons of rank and fortune, with many of whom it was his custom to live for several months at a time. 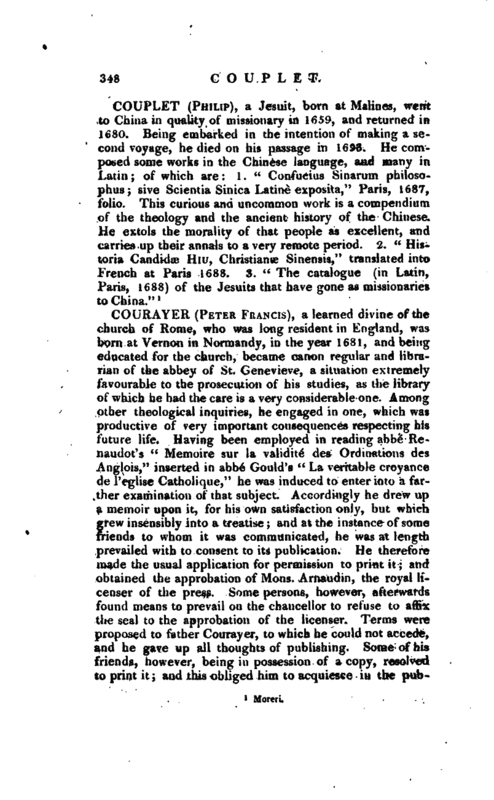 He wrote some other works in French, besides those that have been mentioned; and, in particular, he translated into that language Sleidan’s “History of the Reformation.” His exile from his own country was probably no diminution of his happiness upon the whole; for he appears to have passed his time in England very agreeably, and he lived to an uncommon age. Even in his latter years, he was distinguished for the cheerfulness of his temper and the sprightliness of his conversation. He died in Downingstreet, Westminster, after two days illness, on the 17th of October, 1776, at the age of ninety-five. Agreeably to his own desire, he was buried m the cloister of Westminsterabbey, by Dr. Bell, chaplain to the princess Amelia. In his will, which was dated Feb. 3, 1774,* he declared, “That he died a member of the Catholic church, but without approving of many of the opinions and superstitions which have been introduced into the Romish church, and taught in their schools and seminaries, and which they have insisted on as articles of faith, though to him they appeared to be not only not founded in truth, but also to be highly improbable.” It is said, that soon after he came to England, he went to a priest of the Romish church for confession, and acquainted him who he was. The priest would not venture to take his confession, because he was excommunicated, but advised him to consult his superior of Genevieve. Whether he made any such application, or what was the result, we are not informed bat it is certain that, | when in London, he made it his practice to go to mass; and when in the country, at Ealing, he constantly attended the service of the parish-church, declaring, at all times, that he had great satisfaction in the prayers of the church of England. In discoursing on religious subjects he was reserved and cautious, avoiding controversy as much as possible. He left 500l. to the parish of St. Martin; and gave, in his life-time, his books to the library there, founded by archbishop Tenison. He bequeathed 200l. to the parish of St. Margaret, Westminster, and a handsome sum of money to the poor of Vernon, in Normandy; and, after many legacies to his friends in England, the remainder to two nephews of his name at Vernon. During his lifetime, he was occasionally generous to some of his relations in France, and in England was very liberal to the poor. He had two sisters, who were nuns; and a brother at Paris, in the profession of the law, to whom he gave a handsome gold snuff-box, which had been presented to him by queen Caroline. In 1787 was ‘published, in octavo, by the rev. William Bell, D. D. prebendary of Westminster, “Declaration de mes derniers sentimens sur les differens dogmes de la Religion. par feu pierre franois le courayer, docteuren theologie,” &c. An English translation of this has been since published. The original manuscript, which was given by father Courayer to the princess Amelia, who had a great esteem for him, was written in 1767, which was about nine years before his death. 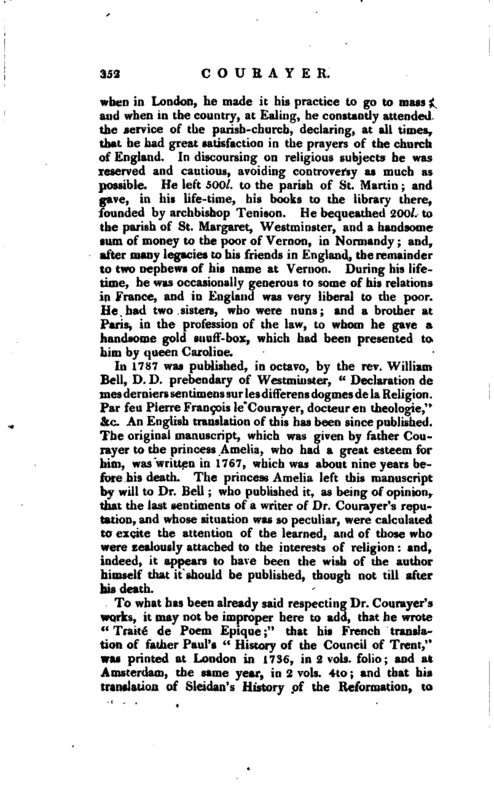 The princess Amelia left this manuscript by will to Dr. Bell; who published it, as being of opinion, that the last sentiments of a writer of Dr. Courayer’s reputation, and whose situation was so peculiar, were calculated to excite the attention of the learned, and of those who were zealously attached to the interests of religion: and, indeed, it appears to have been the wish of the author himself that it should be published, though not till after his death. To what has been already said respecting Dr. Courayer’s works, it may not be improper here to add, that he wrote “Traite de Poem Epique” that his French translation of father Paul’s “History of the Council of Trent,” was printed at London in 1736, in 2 vols. folio; and at Amsterdam, the same year, in 2 vols. 4to; and that his translation of Sleidan’s History of the Reformation, to | which he added copious notes, was printed in 3 vols. 4to, in 1767. By his “Last Sentiments,” published by Dr. Bell, it appears that although he professed to die a member of the Roman Catholic church, he could not well be accounted a member of that or of any other established church. In rejecting the doctrine of the Trinity, he became nearly, if pot quite, a Socinian, or modern Unitarian; he denied also the inspiration of the Holy Scriptures, as to matters of fact; and as to baptism, seems to wish to confine it to adults. 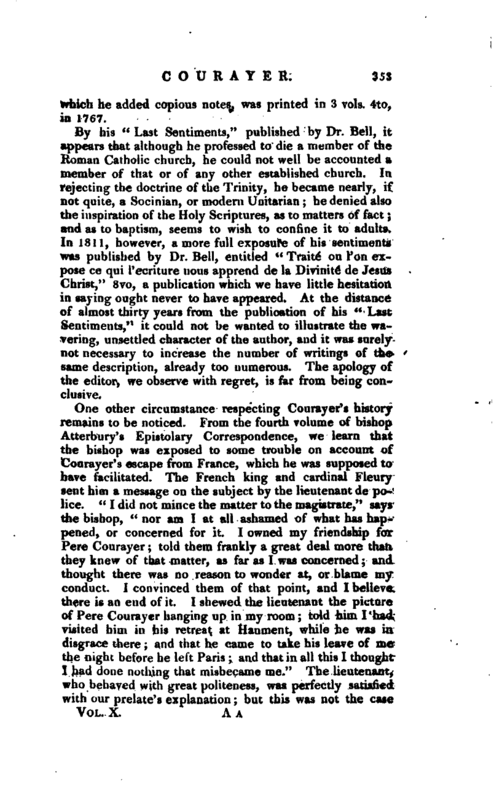 In 1811, however, a more full exposure of his sentiments was published by Dr. Bell, entitled “Trait ou Ton expose ce qui I’ecriture nous apprend de la Divinite* de Jesus Christ,” 8vo, a publication which we have little hesitation in saying ought never to have appeared. At the distance of almost thirty years from the publication of his “Last Sentiments,” it could not be wanted to illustrate the wavering, unsettled character of the author, and it was surely not necessary to increase the number of writings of the same description, already too numerous. The apology of the editor, we observe with regret, is far from being conclusive.